1. Open System Settings > "Software & Updates". 2. 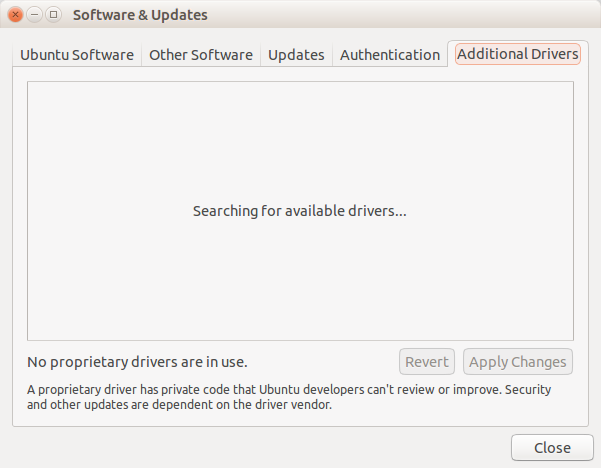 The text "Searching for available drivers..." centered in the box, but no other hint of progress. 3. A list of drivers. 2. A progress bar, if the driver search has determinate progress; otherwise a spinner. self.label_driver_detail = Gtk.Label(label=_("Searching for available "
Unfortunately there doesn’t seem to be any code that makes that progress bar visible. There is another aspect to this minor but irritating bug. Whilst additional drivers are being searched for, the panel displays the message "No additional drivers are in use". This should not be displayed as at this point the software does not know if this is true or not. Not mission critical, but it undermines the professionalism of Ubuntu.